Buddhist Hybrid Sanskrit (BHS) is a modern linguistic category applied to a number of languages used in some of the Mahāyāna Buddhist sutras, such as the Perfection of Wisdom sutras. Buddhist Hybrid Sanskrit languages are composite works assembled from elements of Classical Sanskrit and local Prakrit languages. BHS is classified as a Middle Indo-Aryan language. It is sometimes called «Mixed Sanskrit». Buddhist Hybrid Sanskrit writings emerged after the fifth century BCE codification of Classical Sanskrit by the scholar Panini. Prior to this, Buddhist teachings are not known to have generally been recorded in Sanskrit. While Gautama Buddha was probably familiar with Sanskrit, he preferred to teach in local languages and at one point ruled against translating his teachings into Sanskrit (Sanskrit was a language reserved for the elites of Indian society, and the Buddha most likely wished to preserve the accessibility of his teachings). After Panini’s work in the fifth century BCE, Sanskrit became the pre-eminent language for literature and philosophy in India. Literature in local languages was deprecated by the elites of Indian society, and many works were converted into Sanskrit from the local languages in which they had been composed or preserved. As part of this trend, Buddhist teachings in India started to be translated into Sanskrit. In many cases, the rich grammatical rules of Sanskrit were combined with local features of Prakrit languages, such as a broader vocabulary or simpler grammatical forms. In other cases, incomplete knowledge of Panini’s system lead to the introduction of grammatical errors or idiosyncrasies in these converted writings. The resulting language (or languages) — combining features of Sanskrit with elements of local languages — has become known to scholars as Buddhist Hybrid Sanskrit. The term owes its usage and definition largely to the scholarship of Franklin Edgerton. Buddhist Hybrid Sanskrit is primarily studied in the modern world in order to study the Buddhist teachings that it records, and to study the development of Indo-Aryan languages. 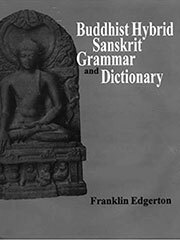 Compared to Pali and Classical Sanskrit, comparatively little study has been made of Buddhist Hybrid Sanskrit, in part because of the fewer available writings, and in part because of the view of some scholars that BHS is not distinct enough from Sanskrit to compromise a separate linguistic category.